The pigs were taken to a bridge above the lake, with red numbers identifying the participants. They were then pushed off the bridge with a stick, jumped into the water and swam towards the finish line, cheered on by the crowd. Groups of tourists stood next to the bridge, taking pictures of the show, according to the local broadcaster CCTV. You jump, we jump! Now, #pigs have their own #diving and #swimming competition.Ten well-trained pigs took part in a...Posted by CCTVNews on 3 Май 2015 г. Tourism official Shi Huang, who organized the event, has been criticized by sections of the public. “This was clearly animal abuse. It may well be the case that pigs like water, but not jumping into it from the top of a huge platform,” one viewer wrote online. 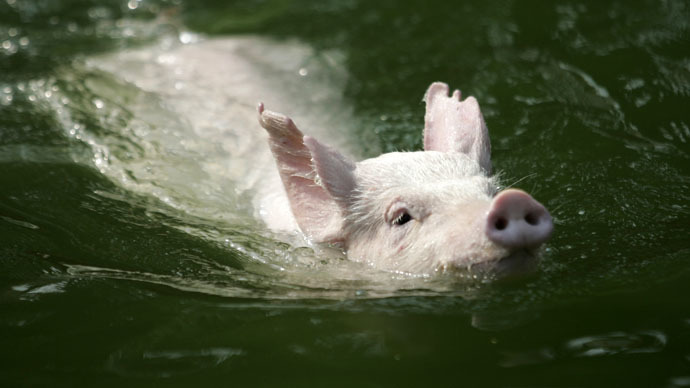 "Anybody who says it is cruel is clearly not well-informed that pigs like water. And once they got over their nerves they clearly enjoyed it,” he added.